The Alabama State Port Authority (ASPA) retained McFadden Engineering to assist the ASPA and specifically McDuffie Coal Terminal in developing measures and best management practices to minimize fugitive dust emissions from the facility. The facility uses 80 acres of the property as bulk storage. Coal is currently the only material that is handled at the facility. The McDuffie Coal Terminal operates as a dry material handling facility with coal loading and unloading, material transfer operations, material storage and product transportation operations being the main activities conducted at the site. The facility has three berths in which vessels can dock to deliver their cargo (i.e. coal) to the facility. 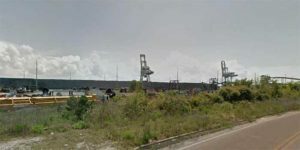 In conjunction with these berths, the facility has two ship loaders, three ship unloaders, three barge loaders, and two barge unloaders, which allow access to a detailed conveyor system and rail system within the McDuffie Coal Terminal facility to distribute the material to the storage area. McFadden Engineering reviewed facility information and met with facility personnel to gain an understanding of the operational activities that could potentially cause fugitive dust at McDuffie Coal Terminal so that Best Management Practices could be developed and implemented at the facility. McFadden Engineering assisted in developing a Best Management Practices plan for fugitive dusts generated from activities at the site.